← The Latest 2015 CISO Mind Map is here! Software Defined Networking or SDN brings a paradigm shift and new promises about how networks are designed and operated. The biggest change is separating the control plane from the data forwarding plane, which, in the current network paradigm are tied together on the same box. This will allow not only ease of management from a centralized location but will also make plumbing of new protocols easy. 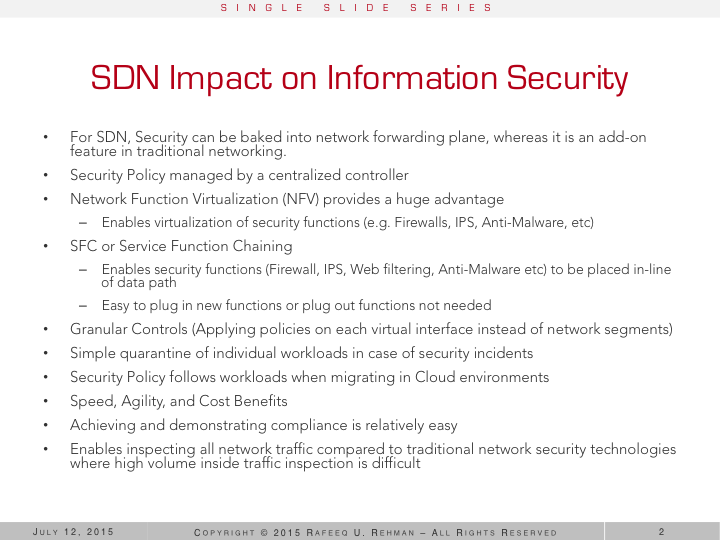 While SDN is focussed on networking, it also brings added advantages for information security, some of which are listed below. For SDN networks, security can be baked into network forwarding plane, whereas it is an add-on feature in traditional networking. This entry was posted in InfoSec and tagged SDN. Bookmark the permalink.